NGC 7000 (Sharpless 2-117, Caldwell 20) is an emission nebula in Cygnus not far from Deneb. It is commonly called the 'North America' nebula due to its shape which has a remarkable similarity to the continent. 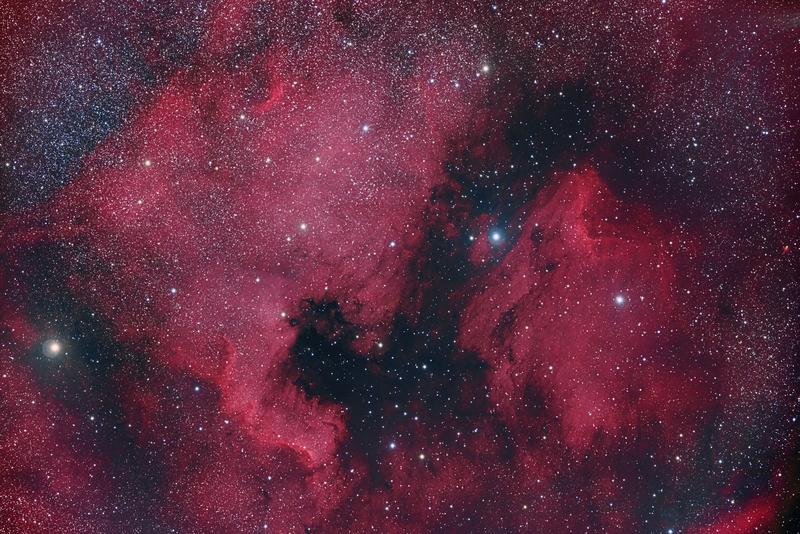 In this wide view, the Pelican Nebula, (IC 5070) can also be seen to the right. The red cloud of ionized hydrogen is made more visible in the photograph by use of an HA filter which increases the contrast of this relatively faint emission. Processing: Image acquisition using CCD Autopilot. Initial processing was done using Maxim DL with subsequent processing with Photoshop. HA was blended with the Red channel. A synthetic luminance was created by blending all the channels.